We head east along Brontosaurus Boulevard to Dinosaur, CO. There we turn south on the Stegosaurus Freeway and follow the Dinosaur Star Scenic By-Way. With names like these we know that we are passing through “Dinosaur Land.” The entire drive to Moab is visually exciting, although Utah roads seem to be competing with California for the “Rough Texture Award!” As we approach Moab, one word comes to mind – RED – the land is really, really red. Not the peachy red of Sedona, but a real rusty brick red. It’s gorgeous and we can’t wait to get settled in and start exploring. We book a few days at the Riverside Oasis RV Park along the Colorado River. The sites are clean and shady. The staff friendly and the location (just two miles south of Arches National Park and a few miles north of Moab) perfect! After unhitching and settling in, we head out to Arches NP to do quick reconnoiter before sunset. The next morning, we start out in Arches, with a drive across the Salt Valley to The Tower Arch Trailhead. We hike a little over a mile and a half to the Tower Arch. 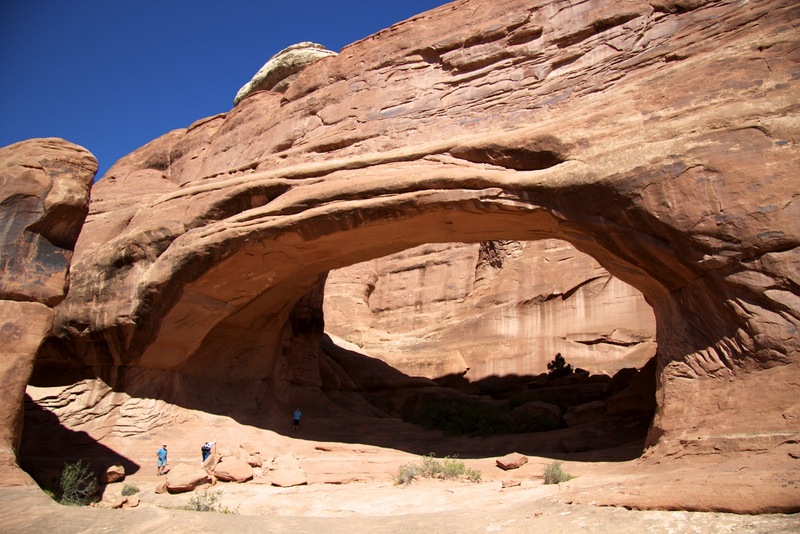 This is our first arch of many and we delight in the remote location and sheer size of this natural monument. 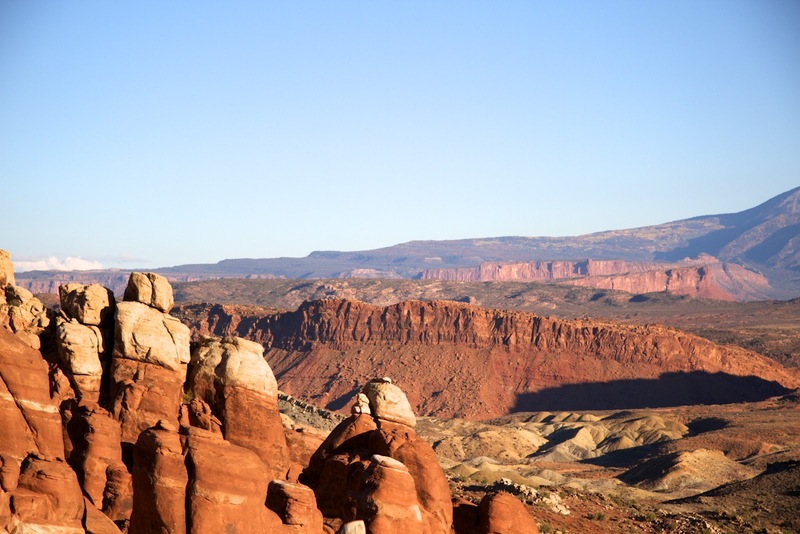 With one hike under our belt we figure out that we will need a lot more than a few days to even scratch the surface of “things to do in Moab.” Returning to base, we book an additional week here so we can stay a total of ten days. That evening we do more research using the park’s free WIFI and start planning our excursions. First up: an aerial tour of the area with Redtail Aviation. 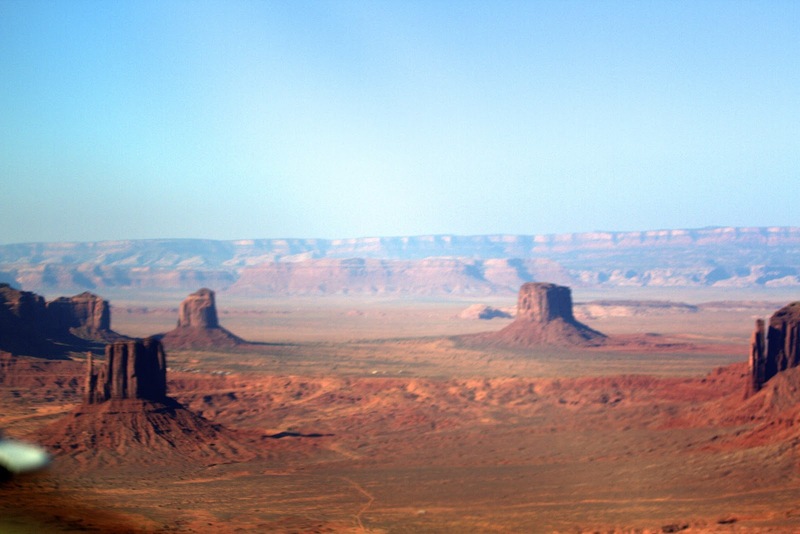 Since many of Utah’s national parks and monuments meet at the Monument Valley, we book the two and a half hour Monument Valley flight over southeastern Utah. We get up at what feels like the crack of dawn, and head to the airport for an 8:30 AM departure. Our pilot Tim is an old timer from the area – we are reminded of the “old” every time he calls us “kids.” He’s a living encyclopedia about the culture, history and geology of the area. As we soar over mesas and canyons, in the Cessna 172 he points out the confluence of the Green and Colorado Rivers, ancient Anasazi ruins, Canyonlands Island in the Sky, Dead Horse Point (where they filmed the final scene for “Thelma and Louise”), Robert’s Roost (of Butch Cassidy fame), Arch Canyon, Natural Bridges, Monument Valley, the Canyon of the Gods and everything in between. After seeing the landscape from the air, we are even more anxious to explore on the ground. That evening we enjoy a cowboy dinner before embarking on the Canyonlands by Night Light Show on the Colorado River. The light show is a little corny, with a canned recording about the history of the area, but visually it is spectacular. Moab is also known for extreme mountain biking and fat tire bikes almost outnumber cars on the city streets. It is also great for foraging with two full service supermarkets offering great selections of organic produce, bakery goods and meats. We stock up. We also sample some of the local color and flavors with a tasty lunch at La Hacienda. The ambiance is colorful and energetic. The Crab Lupe is fresh and flavorful and the Beef Tostada followed suit. Their salsa is spicy and bursting with flavor and a couple of Nega Modellos finishes off the meal. At Woody’s Tavern we discover Cutthroat Ale and Polygamy Porter, two outstanding local beers. Woody’s is classified as a dive bar, but midweek with the late afternoon sun shining through the expansive windows, it looked more like a family restaurant decorated to look like a dive bar. The only staff is one overworked bartender/cook. She’s pleasant, but not overly friendly as she serves us up some tasty hot wings and some not so special nachos. We don’t doubt that this place comes alive well after the sun sets. While exploring the town we stop at the Moab Grill and enjoy a huge plate of nachos, (to make up for the dismal ones at Woody’s.) These go well with a draft of Cutthroat Ale and a house chardonnay. This restaurant is light and airy and the service outstanding. We drive out Potash Road, stopping to view petroglyphs and dinosaur tracks and continue on to just below Dead Horse Point, to view from the bottom looking up to where the final scene for the film Thelma and Louise was filmed. The canyons are steep rugged and amazing! 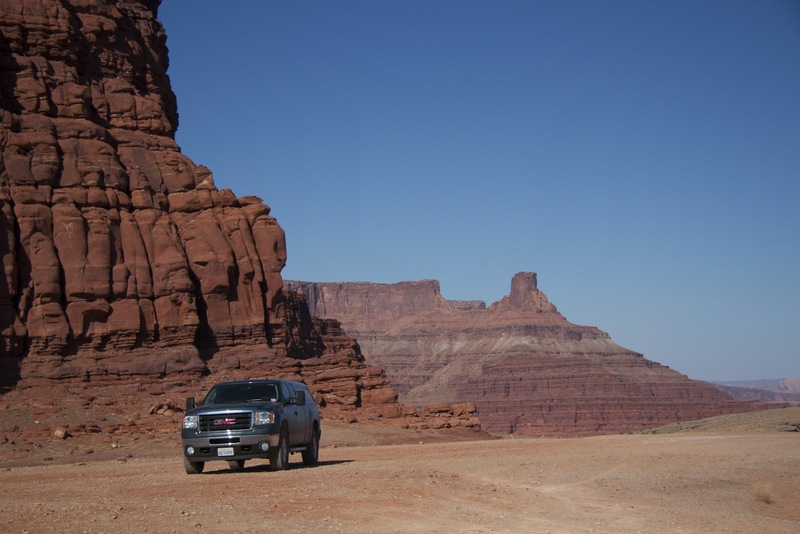 Continuing towards Canyonlands National Park we drive up Shafer Canyon Road a steep rocky switchback cliff hugging 4WD experience. It literally takes our breath away! This is the first time since we started this adventure that stars are visible so we decide to try our hand at some nighttime photography. 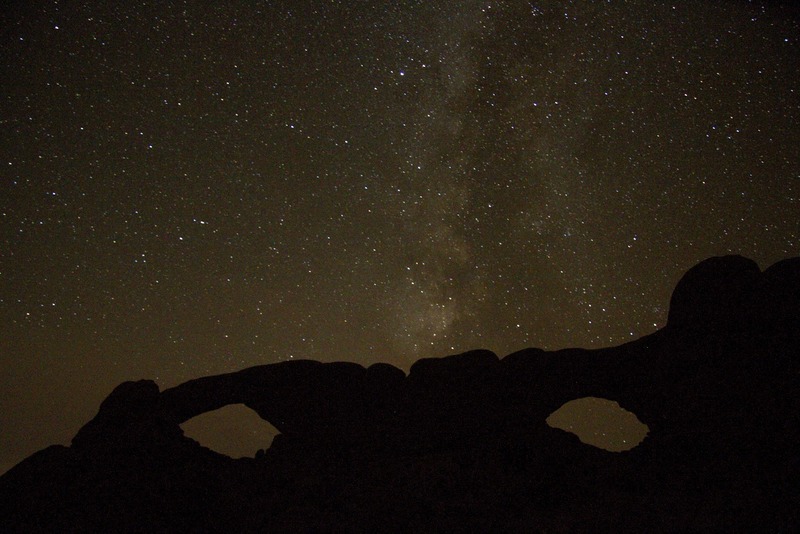 The first night out the moon rises around 10:00 PM and we capture the windows arches from the civilized trail. It’s really warm and we stay until almost 1:30 in the morning. We return a few days later and hike around the back of the windows via the primitive trail. The moon is rising later and hiking this by starlight (with headlamps) is a fun challenge. The temperature is much lower than a few days ago, and we are bundled up, but lying on the slick-rock, watching the night sky surrounded by silence is an experience we will never forget. We are now hooked on learning more about night photography. The next days are spent hiking and photographing arches. 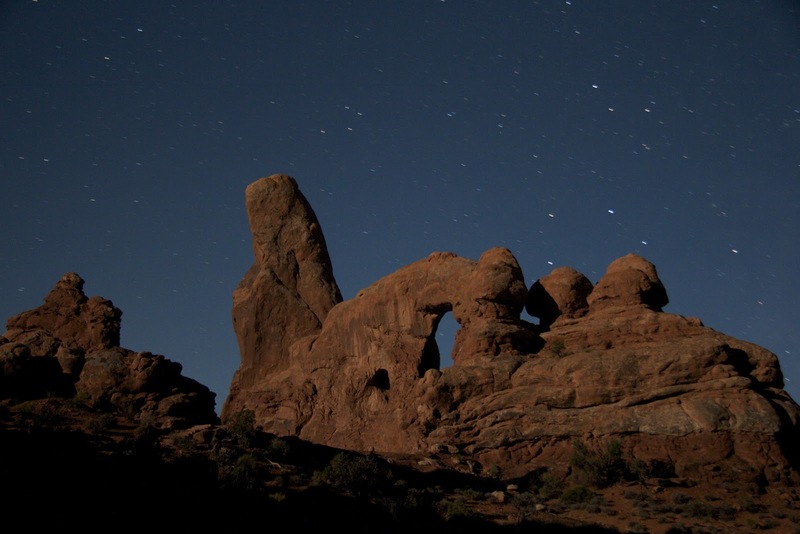 The hike through The Devil’s Garden passes five large arches. 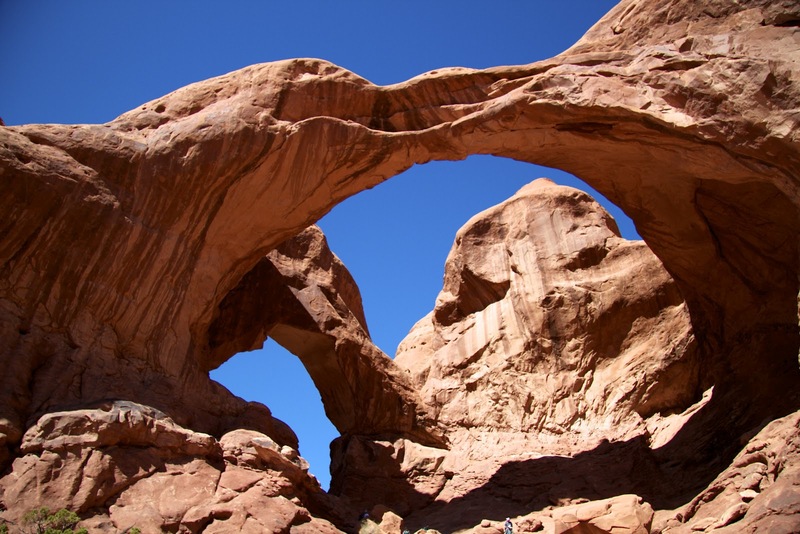 Landscape arch is delicate spanning over two hundred feet. 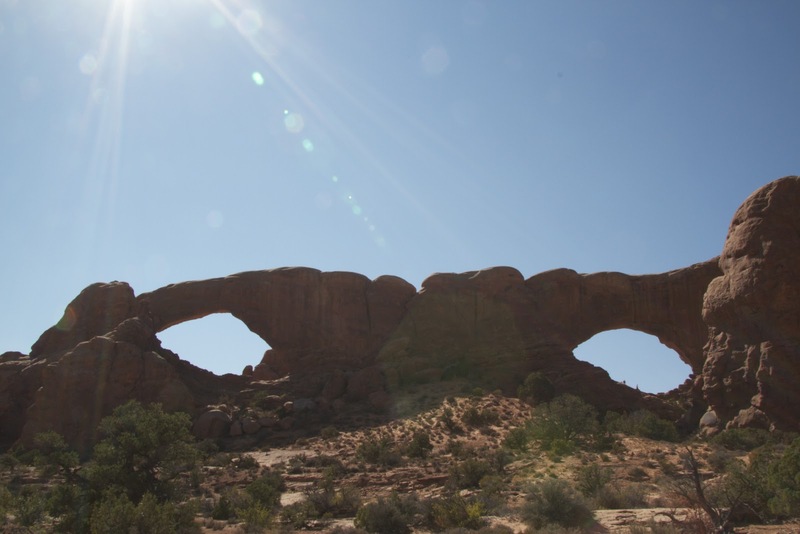 Partition Arch, is a window to a wide view of the mesas and outlying mountains. Navajo Arch is an entry into a secluded box canyon and Private Arch leads to a tingly hike on top of a fin with breathtaking views. This is an exhilarating hike up rocky slopes, across slick-rock fins, through slot canyons and sandy washes; we sleep very soundly that night. 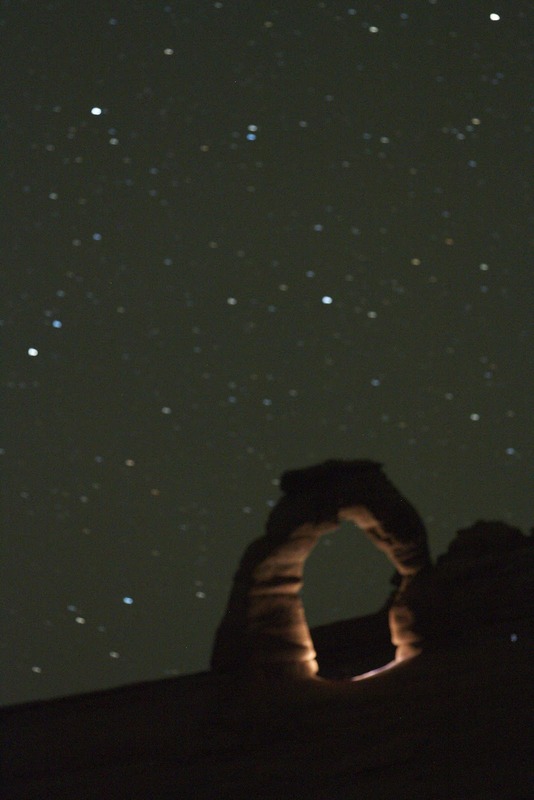 Our final foray into the realm of nighttime photography is to try to catch the iconic delicate arch in the dark. We opt to set up at the top of the Upper Delicate Arch Viewpoint and shoot from across the ravine. Although we reconnoiter the trail during the daytime, retracing our steps in total blackness with the aid of our headlamps is a tad more fun! Once set up we can see that photographers under the arch are experimenting with "light painting" and we take advantage of their efforts. We still have a lot to learn about night techniques and look forward to exploring this more. Dave is the Truck (he's a bad boy from Detroit) and Dimples the Airstream ( a sweet little girl from Ohio) We're Chris and Karen and we're just along for the ride! WIND AND WAVES AND BOARDS OH MY! GLACIERS AT LAST… BUT MELTING FAST! Copyright 2011-2015. Powered by Blogger.